Hydrogels can be exploited to encapsulate and deliver cells and biomolecules therapeutically, as delivery characteristics can be intimately controlled through alterations in hydrogel biophysical and biochemical structure. We are interested in using hydrogels to in situ polymerize delivery systems for cells and/or therapeutics that act locally to aid ischemic tissue regeneration, wound healing, or control inflammation. Figure 1: Hydrogel biophysical and biochemical characteristics can be altered to control angiogenic growth factor delivery. Furthermore, hydrogel chemistry provides avenues for host cell degradation and subsequent migration into the hydrogel to form angiogenic networks. We hypothesize that hydrogels designed to encapsulate cells and control the availability of cellularly-released paracrine factors and/or other therapeutic molecules such as growth factors, gene vectors, or small interfering RNA, will be useful for these therapeutic strategies. As an example, heparin functionalities can be incorporated into hydrogels to control the release of angiogenic growth factors for treatment of chronic wounds, as depicted in Figure 1. Treatment with pro-angiogenic peptides released from poly(ethylene glycol) hydrogels causes human umbilical vein endothelial cells to form honeycomb-like tube networks. This indicates the therapeutic potential of the pro-agiogenic peptides delivered from these hydrogels. Scale bar = 250 µm. 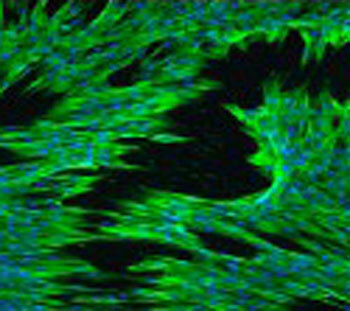 Fibroblast contractile properties are important for succesful wound healing. 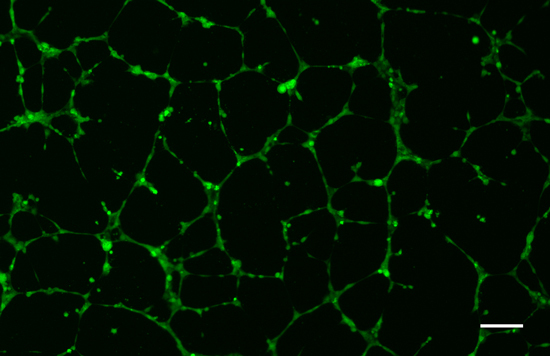 Here, fibroblasts differentiated through cell-material interactions have contractile properties, as indicated by green staining of a smooth muscle actin (nuclei in blue). Osteogenic differentiation of mesenchymal stem cells can be promoted through controlled delivery of a small molecule steroid, fluvastatin, incorporated into hydrogels using a degradable linker. 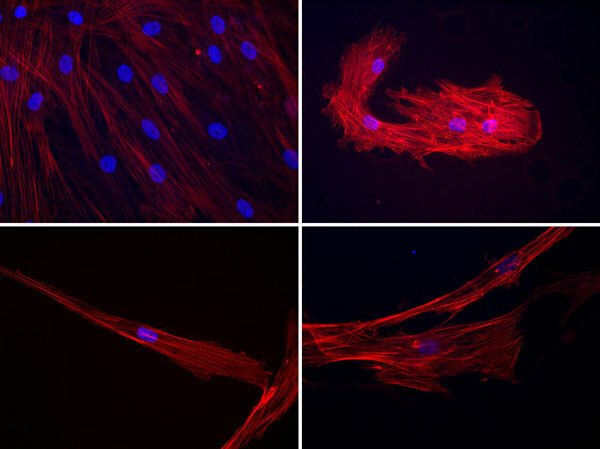 Differentiation can be monitored morphologically, as pictured here where cytoskeleton is stained in red and nuclei in blue, or through gene expression analysis.